Bring home this beautifully-designed wall clock from eCraftIndia and add some charm to your walls. Featuring a round dial, three hands, and English numerals, reading time from this Quartz clock is easy. 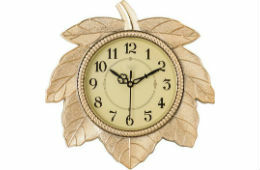 This gold-colored wall clock will give your walls a luxurious makeover while the beautiful leafy design makes this clock a decorative piece.